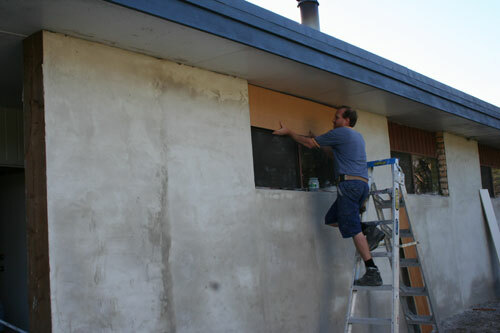 The front of the house is completely rendered with a flat cement finish, with David now concentrating on the window recesses (covering up the last of the mission brown). We plan to paint the house now, but are undecided as to which exact shade. 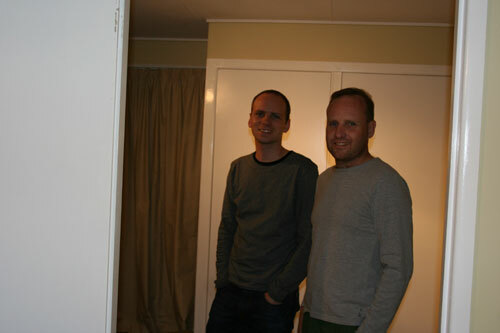 This evening, David was able to show Ben around the finished studio apartment. As it’s now completed, Benjy will probably move into the studio apartment tomorrow. David still wants to finish the front of the kitchenette cupboards/drawers and hook up the plumbing, but with the floorcoverings down and curtains in place, it’s definitely livable!